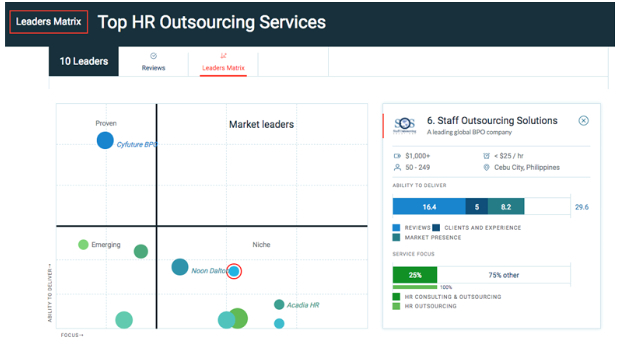 Clutch is a ratings and reviews platform covering over 7,000 firms across 500+ industry verticals and in their latest press release, Clutch identified the top staffing, recruiting, and HR outsourcing companies in the industry. Their analysis is rooted in client interviews and feedback, where Clutch speaks to a company’s references about the challenges, solutions, and results of their time working together. Coupling this, Clutch utilizes a scoring methodology with over a dozen factors such as clientele, market presence, and industry recognition, strengthening their evaluation. They are thereby able to form a Leaders Matrix for a particular industry and identify which firms in it have the ability to deliver. To read more about our clients’ experiences and how we’ve become an HR outsourcing leader, keep up-to-date with our Clutch profile here.